On this episode we wrap up the medicare series with a discussion of how your monthly medicare premium is calculated. Interesting article this month in Kiplinger Personal Finance. It is about a study as to how much “income” we need to feel happy. I don’t know if having a larger income makes folks happy, but would have to say it probably reduces some financial stress on folks. I guess it boils down to whether you had a large income and lost it or if you’ve never had a high income to begin with. clothes shopping: I know most are expecting me to complain about the wife’s shopping expeditions, but I actually have to commend her for being a super shopper recently. As we do try and make a game out of finding bargains, I have to mention her recent shopping trip to find a dress for her high school reunion. She of course went up to the outlet mall into a well known store to scout out a dress. She found one that had been marked down from $350 to $100 and when she got to the register found out it was on clearance for $40! needless to say, I as impressed. Personal finance magazines: my favorites are Money and Kiplinger which always have great info. This month Money is running their “best deals on everything” with lot’s of tips on saving money. Very interesting. Travel: we did the family beach vacation and one thing we have been doing for a couple of years is going to VRBO.com to find a beach home to rent. This year my wife found one that was available for the partial week we wanted to go down, and negotiated a daily rate equal to 1/2 of what was posted. It never hurts to negotiate with the owner if their property is going to sit vacant. It’s a win / win. So the wife and I both posted about the Spring Break trip. I of course reluctantly agreed to do a Spring Break trip this past April with the kids. Normally, we avoid travelling at this time as it seems the prices are increased and half of metro Atlanta heads to the same Florida destination. My wife is a bit of a trip planning junky, so once I turned her loose with a strict budget I was pleasantly surprised at how many money saving offers she found. The first was a couple of days at an Orlando hotel for less than 1/2 the normal rate by taking advantage of a little known “girl scout” discount the hotel was offering. (yes, i do have a daughter in the girl scouts!). She also found us a fairly good deal on a 3 day Bahama cruise that we did on the back half of spring break. Of course this wouldn’t be any fun if I did not complain about certain items: I am learning that the lodging (whether hotel or cruise line) is only 1/2 the expense. Tack on the $400 for a day at the theme parks, all of the meals, drinks (yes when you are packed on a cruise ship like a sardine all you have to keep your sanity are the cocktails), and miscellaneous souvenir and activity fees and you best just double your estimated vacation cost estimate. We are still doing the coupon thing, well the wife does – I simply remove the insert from the Sunday paper. It definitely helps knock a few dollars off of the bill each week. As most things go, the preplanning using the coupon websites has dropped off. We all mean well when starting those but sometimes just taking the time to plan that much in advance is difficult. I’ll keep posting on our progress. I would argue that outside your mortgage that food is the number 1 expense for most. At least that is true in my household and for the cashflow statements I see from my clients. 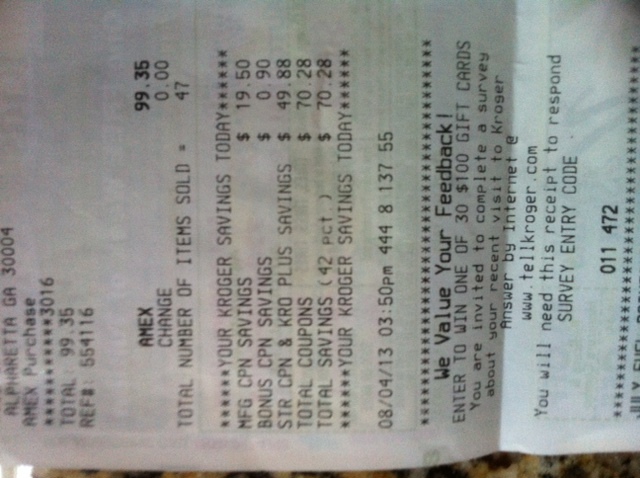 Trying to save money on grocery or dining out expenses has become a type of challenge at our household. But like most we get in the habit of cutting coupons and then get out of the habit and resort back to our unthrifty ways. It’s like exercising, if you get in the habit it is easy but once you skip a few times it is easy to fall back into old routines. Recently, we had fallen back into the habit of doing the one big grocery run during the week followed by numerous, “I’ll stop by on the way home and pick this up” trips. It’s just to easy when there is a Publix that we pass numerous times each day. The problem is that those unplanned trips are costly. When I stop by after work I certainly don’t have any coupons so it is definitely not a frugal trip. To combat this we have tried to do weekly menus and get everything in one run . This works all of about 2 weeks and then we fail to plan for the week and fall back into the multiple stops throughout the week. 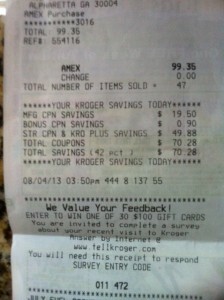 This past week the wife surprised my when she sat down with a piece of paper, the Sunday Coupon section and a new website (couponmom.com) to plan her grocery strategy. I really didn’t think it was much different from what we had done in the past, but when she told me that with a little work she had gotten $250 worth of groceries for $150 – I was impressed. She actually looked at where the sales were, what she had coupons for and then shopped at both Kroger and Publix to take advantage of each . It took a little longer but saving $100 makes this Miser very happy. Now let’s see if we can make this a habit! The wife’s busy with the kids this summer and doesn’t have much time to chime in to these discussions. Hopefully we will get back to it in a few months when they return to school. We are still busy at work with our basement project. We have had our share of financial conversations as we approach some of the higher ticket items in finishing this project: furniture, electronics (tv / surround sound), and various items needed to make the room liveable. The one problem with any home improvement project is that it tends to expand. Finishing the basement has now turned into possibly repainting the entire main floor, which then turned into buying some new furniture for our living room and moving the older stuff into the basement, etc. It can expand the budget considerably. I am the type that I get an idea and a budget in mind and it is very hard for me to divert from that. The thought of more expenditures causes panic attacks. Hope on the other hand would prefer just to get it all done even if it is a little higher than what was budgeted. That is what makes a marriage is finding a happy medium and ways to compromise. (I call it compromise, but she normally gets her way in the end).